By the time you read this, Eau Claire’s Redevelopment Authority will have met with leaders at Royal Credit Union to discuss the next major opportunity for Phoenix Park. RCU’s cooperation could mean the extension of Galloway Street by two blocks – a critical component to creating a walkable and enjoyable neighborhood with the maximum economic benefit. The discussion is happening now because the Post Office’s lease running out this coming September, and RCU has the option to purchase their land this June. “The idea is to come to an agreement with RCU on parking, keep the post office downtown perhaps in a new building, and continue Galloway Street through to allow more development,” said Mike Schatz, the city’s economic development director who is also involved in the RDA and Downtown Eau Claire Inc.
OK, let’s break this down one piece at a time. For many reasons, city officials would love Galloway Street to run through to Riverfront Terrace (connecting the 53 Bypass directly to the gem of downtown). 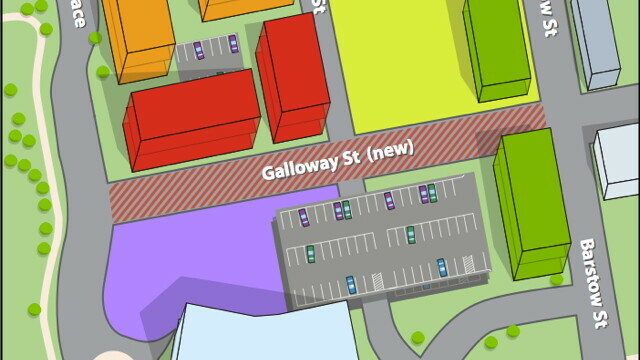 Commonweal Development has indicated Galloway’s extension would prompt them to build two more buildings very soon (the red ones on the map above) on the same block they’ve already started construction for two other buildings (the orange ones above). The tough part – this plan would shave off a piece of RCU’s existing parking lot. However, that parking could be allocated into a parking deck or leveled structure behind the current post office (over Hobart Street). This also allows RCU land for future development (where their parking lot currently sits, shown in purple on the map), should they stick to their long-range plan and expand into an additional building. The current post office building would be razed, making way for new commercial development of some kind (see the green building on the map). The “new” post office would then, hopefully, stay downtown in either an existing building or a new one proposed on the empty block across from The Livery and Pad Thai (conveniently next door, also shown in green).